Kaniz Fashions Limited is a trend setting pioneer in corporate governance in the country and enjoys reputation as a world class producer of apparel that is admired worldwide for their quality and design. A team of highly qualified and experienced and committed professionals under the guidance of top management of the company have achieved admirable measure of success in a short span of time. This has been possible because the company never compromises on quality and settles for nothing but the best. The most modern technology, efficient, and dynamic management and commitment to the highest work standards is the main theme of the Kniz Fashions Ltd. for its future growth. It was established in October 1998 under the group named Group QA to product good quality RMG product for international market. KFL’s success is due to two key factors; Innovation and Commitment. The most surprising fact about KFL is its world-class production cutting age widespread across Group QA. This organization is also adapting some important policies like getting official approval of ISO Quality Standard practices, ensuring total compliance of various Code of Conduct requirements of prestigious buyers across the world, prioritizing the need for creation of ideal work conditions for the workers and ensuring proper health care & safety for them. This thing has awarded KFL a respectable position in the top of the RMG manufacturers in Bangladesh. Group QA commenced its business in 1965 and entered into garments division in 1983 with the pioneering unit Abedin Garments Ltd at 50, Gulshan, Dhaka-1212. Gradually, it developed another two units namely Kaniz Garments Ltd in 1994 at 158 Tejgaon I/A, Dhaka-1208 and Kaniz Fashions Ltd in 1998 at 50, Gulshan, Dhaka-1212. In view of the growth of its business and to take the challenges of various issues with particular reference to post multi fibre agreement era, Group QA established its own production plant at 228/A, Tejgaon I/A, Dhaka-1208, commissioning on It’s of January 2003. It is an 8 (eight) storied building with 146,000 square feet. It also ensures a healthy working environment and addresses various aspects of compliance issues and welfare of all employees. It has about 3000 efficient work force, capable of producing over 3.5 (three & a half) million woven garments per year. Presently, Group QA is recognized as a state-of- the- art manufacturing unit of woven garments. To ensure the highest quality, timely delivery of garments and remain responsible to our buyers through adherence to internationally established code of conduct and ethical business practices. To attain market leadership through unmatched quality, a diverse and unique product mix, empowered employees, world class systems, and the highest ethical and professional standards. Provide the highest quality products and services consistent with customer needs and continue to earn the respect, confidence and goodwill of our customers and suppliers. Foster a culture of trust and openness in order to make professional life at the Kaniz Fashions Limited a stimulating and challenging experience for all our people. Strive for the continuous development of Bangladesh while adding value to the textile sector. Area: Total Floor Area 146,000 Square Feet. Capacity: 3.5 (three & a half) million woven garments per year. TESCO: Main product –Ladies Blouses and mostly cotton base fabrication and polyester. Standard of quality and timely delivery of products to buyers bears a testament to its continued excellence year in and year out. Ladies blouses and trousers in any discipline of fabrics (both – hanger & flat pack). b) Boy’s shirts – flat pack. e) Skirts. Waist coats – padded/non padded. We work together as a team for implementation and continual improvement of total quality system in order to achieve satisfaction of our internal and external customers. Mandatory to conduct 10% random inspection of all incoming fabric rolls by AQL 4 point system to access the quality level of in-house fabric. Maintaining blanket for shade control for wash, non-wash both. Performance in every sewing line for ‘in process’ & ‘out put quality’. Root cause analysis (RCA) or fish bone analysis introduced to eradicate the source of defects. DHU & RCA applied in finishing section also. KFL conduct is business through several departments. All the responsibilities are divided to seven departments. It has a number of sections and each section has definite responsibilities Short descriptions of about the department are cited below. The production department is headed by Executive Director and has wide range responsibilities. The department looks after total factory operation. It has a number of section namely Production planning, Administration, Store, Power & Fuel, Sample, Cutting, Sewing, Finishing, and maintenance section. Each section has several responsibilities. The main duty of the department is to collect buyer. And then try to negotiation with the about new order. As the buyers are highly concern in fabric they test the sample and deals with the sample-testing price and time of shipment. The department comprises three sections Finance, Accounting and Commercial Finance mainly for sources and uses of find, Inventory management. Account section is making, the balance sheet, profit and loss account, cash flow statement,. And the commercial section maintains all the documents and precedes these for export and import on lt. The principal function of the procurement department is to source the materials both local and foreign as required as requested by the user department. The organization is 10 stories building, each floor it has several computer that are connected through LAN with server. IT department manage and maintain all function related LAN and computer. To provide total security of the organization through Security Section is also the activity of HRD Department. Main activity of this department is to reduces effort and cost and improve the environment. Along with it the following activities are done by IE department. The World economy has changed in significant ways during the past several decades especially in the areas of international trade and industrial organization. Two of the most important new features of the contemporary economy are the globalization of production and trade. Therefore today’s technological systems are characterized by orientation to productivity: this can be achieved through the usage of apparel engineering concepts. Generally, Industrial Engineering is defined as an approach applied to all factors, including human factor involved in the production & distribution of production and services. Most engineering projects not only increase company profits but also result in higher earnings for employees. As manufacturing continues to become a commodity, just to stay competitive, companies are pressed to optimize the operations continuously to keep product costs down without compromising on quality. Most companies are willing, and in fact eager, to apply industry engineering concepts in their approach to manufacturing, to stay competitive, this ever growing competitive world. The roles and responsibilities of the industrial engineering department are not just limited to timing operators and making operation bulletins as it is only a part of the job. The I.E function can contribute significantly to improvement in working and productivity of almost all the departments of apparel manufacturing. The truth is that engineers and engineering mean many things to many people. In our discussion on engineering, we want to talk about the branch of engineering known as industrial engineering and more specifically, industrial engineering as it relates to the apparel industry. Before we do this however let’s see if we can define some basic terms and concepts that will make our discussion more meaningful. Engineering –a science by which the properties of matter and the sources of energy in nature are made useful to man. Industrial Engineering is the engineering approach applied to all factors including the human factor, involved in the production and distribution of products and distribution of products and services. Now that we have arrived at a definition of industrial engineering let’s talk about what things are done by an industrial engineer. Let’s refer to these as the scope of the job. Time Study, measure and improve the way individuals perform their jobs. Design and install a better system of coordinating the jobs assigned to individuals into a group effort. Specify predict and evaluate results obtained. The area of industrial engineering practice is not only limited into production management in floor level but also in manufacturing concept it has several activities in each and every area like Sample, Merchandising, HR, Procurement, Quality department etc. Lets cited the engineering approach in several area of manufacturing. Determine the optimum method of construction to achieve require finished product efficiently. To calculate the production cost for that particular garment by multiplying the total SMV/SAM of the garment with the average cost incurred by the factory to produce on SMV/SAM. In the respective area the activity of IE are almost same like WIP control, Efficiency and capacity calculation, production controlling, etc. IE works in different stage i.e. Development sample, Approval sample, Additional sample, commercial sample etc. of product sampling to ensure the sampling production planning, reduce the lead time calculating sampling efficiency as well as capacity. Quality is an asset, which may be offered to the potential customer of a product .there are two aspects of quality which contribute to the ultimate quality of product. Quality of design is the first aspect which depends on the type materials used specs specified by the buyer method of production known of the design and skill level of the person. Quotas and piece rates: Determining quotas and targets and arriving at piece rates where piece rate system of production is prevalent. Costing: By knowing how long it takes to perform a job the total time and cost manufacturing a product can be determined. Determine sale price. Manpower planning: By knowing how many units one person can produce it can be determined how many people are needed to product given volume. Machine requirements: The number of machines required can determined by knowing the out from one machine. Production planning: Time study enables us to measure the capacity a plant to produce .Decision as to how much volume to load into a plan can be made. Plant Layout: The location of machines and equipment to provide the best work flow. Production Flow system: Determine the best way to move work from job to job. Machines and Attachments: What machines are the best for a giving job / what attachments simplify the job? Pay Systems: Deciding the best way to pay people for their work effect. Operator Training: Responsibility for program of training new employees. Production control system: Design system of measuring and controlling production flow through plant. Cutting Room: Engineering jobs in cutting room for incentive plan> Also might include program to increase material utilization. Quality Control: Design program to measure and control quality of workmanship in plant. Distribution: Engineer warehouse and shipping facilities. Payroll system: Design Payroll procedure to handle pay system and generate necessary cost reports. Others: Plant safety maintenance, Supplies. One of the main benefits of almost any engineering effort is that it makes work simpler to perform. This holds true for operators, supervisors and top management. When an engineer analyses any area of work he does so with the thought in mind. Do not be misled about into thinking however that work simplification means people always will be doing less work. They may infect doer work but within the same amount of time as before. Because work has been simplified people ability to produce is increased. The ability to produce more within the same amount of time is company insurance for survival .this ability means that the company can now accept more work. It means that costs be spread out over more units of production. It means that profits improve. When a company profits increase everyone involved is in a better position. Owners and stockholders prosper. Management and supervision are rewarded for their performance. Money is available to do more for the operators .a Company is able to expand which creates more jobs. Most engineering projects not only increase company profits, but also result higher earnings for employees. Most companies are willing and in fact eager, to share with its employees the financial gains that are available through engineering. My internship program in Industrial Engineering Department at Group QA started in 15th May, 2010 and continued till 31st August 1, 2010. During the internship program in KFL I did not have any organizational position and authority. As an internee I was assigned in some responsibilities and duties that I tried to perform sincerely. At the first day of my internship they introduced me with the organization staff. They told me about my duties and give me an overall idea on activates of industrial engineering department. Firstly total duration was divided into working days that came to a total working day of three months and were distributed in the following manner. Duties under IE Department in different sections are almost same. Let’s discuss briefly my duties in different section. At first I started my internship joining at pattern and sample section of KFL. My duties was to observed the production process of sample that means how the operator making sample as well as the sequence of production process. Then I started to take time of the process. In sample I see lot of operation bulletin of several styles of garment. After fifteen days they send me to the cutting for understanding the overall process of cutting section. In cutting I also take time of cutting process i.e. lying, cutting, numbering, bundling etc. I started to calculate the SAM of cutting processes and calculate the efficiency of cutting section. They sent me to sewing section at the last of June, 2010. It is the very vital section of garment production because the bulk quantity is sews in this section. In sewing I started to be familiar with several machine i.e. Single Needle Lock Stitch, Single Needle Chine Stitch, Double Needle Lock stitch, Double Needle Chine Stitch, Over lock, Button stitch, Button Hole, Bar tuck etc. My first job was there to understand how the entire procedure of making a garment are divided into small processes and assigned each small process to several operators. The entire process of breakdown operation is call garment layout. I calculate SAM, Efficiency, DHU, and maintained the number of machine. Then I started to work on operation breakdown and finally started to control WIP in sewing Line. In finishing section all garment are finished finally and decorate with accessories i.e. price ticket, adjustable waist tag (if any), wearing ploy etc for shipment. In finishing I prepare the worker allocation based on the SAM. There I also calculate the SAM, efficiency, worker absenteeism percentage etc. I learn about the overall concept of IE and activates performed by IE department. Main points of my learning are flowing. Work study: It is the process of motion study so that breakdown the element of the process and reduced the unnecessary element. And then standardized the process. Time Study: It is the study of time required of a specified process. SAM: SAM is the time required to complete a process with all allowances. Line Balancing: Is the process of distributing work load properly to maintain an optimum target. WIP: It states for Work in process and it is the different between out and input. Operation Bulletin: It is the overall description of a garment such as operation break down, SAM, required machine, target, excepted efficiency etc. Operator performance: An Operator performance is the measure of how well the operator performers and expressed in percentage scale. Process analysis: I know about the small process of making garment such as collar joint, Sleeve joint, Side seam joint, etc. And also learn about the specific parts of garments. Formula of IE: I learn several formula using by IE department i.e. formula of calculating SAM, Efficiency, operator performances etc. that are maintained the analysis part. Garment Business today became very competitive. Low price, less lead time, high costing, many competitors made the market saturated. Depending on the level of journey this business came to a professional and scientific stage, where accurate planning, proper time management in production and operation, high skilled technical support, optimum cost-profit estimation are very important issues to survive. Now a day’s it’s impossible to run a Garment Manufacturing operation without Scientific and Professional Approach. Industrial Engineering Concepts are developed on this demand. Industrial Engineering Concepts are required in every stage, Costing, Product R&D, Planning, Supply Chain, Production management, Maintenance management, Layout plan, Productivity Improvement, Cutting Improvement, Manpower Skill Development and so on. Every Garment Owner now understood that, only Scientific and Professional Approach can make the profit. So demand for Industrial Engineering became very high, and still the Availability of Industrial Engineers is very less than the demand. On this mentioned demand Kaniz Fashions Limited also established Industrial Engineering Department and it has 52 members which divided into 2 section titled ‘IE Team’ and ‘Production Accounting Team’. It has 20 well trained industrial engineer and 22 production accounting officer. The production account team works to collect the hourly production data and they are reported to the relevant IE. And IEs are assigning for monitoring and execute IE activity in assign section like sample, cutting, sewing and finishing. Entire IE team and their activity are maintained and controlled by the product engineering lab and IE manager is the head of the department. The product engineering lab is the heart of all research and development work’s in the apparel manufacturing. The product engineering lab caters to all departments with special emphasis on production department to provide low cost measures to improve the overall working or to provide solution to any problem in specific. To study all forthcoming style and analyze the sequence of operation suggested by industrial engineer to check for any improvement in the equipments, process flow sequence of operations folders & attachments work aids for achieving better productivity & quality with low cost of production . To coordinate with engineers working on floor to discuss the problems faced during production and deviation in the suggested and actual results and to provide timely solutions for these problems. To work on continuous improvement program for developing new methods folders/ attachments work aids. To get involved in the precut during the sampling stage itself to suggest better manufacturing techniques and to anticipate the potential troubles that could come during production. Product engineering lab should suggest a solution for these troubles as in some case approval from merchandiser or buyer is required to change the construction and seam / stitch types. To work closely with product development cell on converting the designing attributes in to engineering attributes. Product engineering lab should also suggest solution to quality issues. The lab should keep a track of latest machineries and advancement in the field of apparel manufacturing and suggest new machines and reduction techniques for efficient production. The industrial engineer in the product engineering lab should be able to allocate the requirements on resources and also advise the production planning on the possible targets which can be achieved- taking into account the past performance on requirements on resources and also advise the production planning on the possible targets which can be achieved –taking into account the past performance on previous styles. IE team comprising with 19 IEs and an IE Manager. In this way engineer observed a process to understand the sequences and effectiveness of that process. Actually the IEs observed the motion of operator by which the process done. Different aspects of method study are discussed below. This topic involves methods engineering at the individual workplace. It is important to note that methods engineering is greatly influenced by the basic sewing room design. The use of a transporters for example can sometime limit workplace refinement. For this reason it is necessary to plan methods and sewing room design simultaneously so that the correct trade-offs between effective individual operation methods and the realities of the business objectives are chosen. Machinery selection must of course be related to methods engineering. Also methods standardization is an absolute requirement for accurate work measurement. Motions involving fingers and wrist. Motions involving fingers wrist and forearm. Motions involving fingers wrist forearm and upper arm. Motions involving fingers wrist forearm upper arm and shoulder. j) Folding of matching of parts en route to machine. Different aspects of method study are discussed below. The effectiveness of a motion pattern is determined by the principles Motion Economy. Finally, remember the big picture. All methods improvements have a cost but some cost far more than others. (a) There should be a definite and fixed place for all tools and materials. (b) Tools materials and controls should be located close in and directly in front of the operator boxes for parts as in the elastic and tabs example label holders on the machine head and turning attachments between machine head and the operator on the edge of the table are examples. Tables to the left of the needle are often best cut away to allow trucks to be moved as near as possible to the needle. (c) Gravity feed bins and containers should be used to deliver material close to the point of use. Gravity feed bins for pieces such as hooks and eyes zipper slides buttons etc. Right angled lay out of tandem presses with disposal rail between them and pick-up opposite the disposal with room for operator to turn and move in a straight line between the two. (f) Provision should be made for adequate conditions for seeing. Good illumination is the first requirement for satisfactory visual perception. This is a specialist subject on its own but good fluorescent general lighting and needle lights are commonly accepted practice in sewing rooms. (e) Foot pedal operated pocket turning attachment which pushes a blade into the comer of the pocket. Example: Attachments already mentioned which perform tow operations at once. Example: Suspension of hand iron over back. 1. Is this operation necessary? 2. Should this operation or portions of the operation be combined another operation? 3. Is the operation performer in the correct sequence? 4. What sewing machine attaches mints or work – aids are needed? 5. Will the operation yield satisfactory levels of quality? 6. What type of training curve will the job yield? 7. What material usage factors are affected by the job? 8. What principles related to the usage of the human body should be into account? 9. What considerations on space and indirect labor requirement apply? By considering all these aspect the method should be standardized in a specific way that is acceptable to all. After standardize the method IEs are work to establish it. When standardize then the IEs are divided the process in small motion or element that called elemental breakdown of process. They take time for each element and give different rating of each element occurred. Here rating is the comparison of the operator current performance to his/her natural performance and expressed by percentage i.e. 80%. By taking time and rating IEs calculate the SAM of the specific process. The elements of time study which consider calculating the SAM are given below. (d) Bundle handling time, standard is 2% of basic time. (e) Machine delay time. That is different for machine such as for Single Needle Lock stitch, Single Needle Chain Stitch both are 12.5%, Double Needle Lock stitch, Single Double Chain Stitch both are 17.5%, Over Lock – 3 thread is 7.5% and 5 thread is 9.5%, Button Hole, Button Stitch is 9%, Bar tuck machine is 6% and Iron is 2.5% etc. Operation Bulletin is an important tool used for product analysis .operation bulletin is a documented form of sequence of operations in a product. It contains all the information about the machine required and the total no. of operation total no of operator required (the operation bulletin shown at appendix 1). It should cover all operations that can be directly related to single unit of a product e.g. The operation bulletin should be developed at the earlier stage of product development. ● Investment in inventory – inventory is money invested in raw materials when we don’t move the goods through the plant quickly we are affected cash flow directly. ● Ability to reduce the production cycle – By having low inventory between operations garments usually have less time large inventory levels between operations keeps goods waiting longer to be processed. This increases the over throughput time. Low throughput time permits better co-ordination between sales and product. It also permits a quicker turnaround on which improves cash flow. Low cycle time give manufacturers the ability to handle multiple styles. I. Production planning – this requires planning from marketing sales to determine what will sell and what needs to be produced when. This provides the basis to determine how many operators machines will be .IE needed can calculate the required resource any style and block the capacity of this style at a specific efficiency build up. II. Trims control – Trims are buttons zippers labels thread elastics and so on .a cut should enter the production line only when someone has verified that all the trims needed are available. An update inventory of trims should be kept. A missing label could halt a 12000 unit cut. Holding the 12000 units in inventory is not acceptable and could lead to other problems. III. Production build-Up – careful consideration should be given to loading the production lines. If you will overload the line with work that will just sit stagnant .I.E can provide figures in terms of production to be expected from any line which can help in feeding control and thus managing the WIP. IV. Balancing – Even if you load the line based on its capacity, you might find the inventory accumulating due to an unbalanced production. To be expected from any line which can help in feeding control and thus managing the WIP. V. Cut Flow control- in order to keep control over WIP and to keep the cycle times low you need to have cuts go as close as FIFO as possible. For this reason strict control must be placed on the tracking of cuts as they flow through the production floor. This is a very important tool and helps in decision making while confirming order. By planning the capacities of the production facility, the merchandise division comes to know the exact production slot available before confirming order. The label on denim pant says ‘made in Pakistan’ but it is quite possible to the fabric came from china, zippers and trims came from Hong Kong and cutting ,Sewing , Finishing, Inspection& packing happened in Pakistan. When several organizations across countries have to work together to product single garment, co-ordination of production schedules becomes a necessity. Real challenge lies in planning production schedules in a manner that all reasonable utilization of factory at all given point of times. It is not only garment manufacturing units that need to plan the factory capacities, but the fabric and trim suppliers in order to deliver the goods on time. Coordinated planning should also be flexible to respond quickly to unforced changes and that is the most difficult challenge. The most common question is how do we plan and calculate capacity when the company does multi style products. The answer is – A factory capacity should be planned in a manner that it is independent of styling. Hence production capacity for all styles has to be converted into common unit of measurement, which is TIME. The following parameters have to be calculated to ascertain the factory production capacity. Similarly line efficiencies can also be calculated. In this case the total available hours are calculated and this includes the hours worked by operator and helpers in the line. By combining the efficiencies of all lines in a factory, the Factory Efficiency ascertained. The below example illustrates how the calculation is done. Tins average efficiency is then utilized for calculation of factory product capacity. A 500 machine factory employs a workforce of 600 people (operators & helpers). The factory on an average works for 26 days in a month, 8 hours shift per day. No of garments that the factory can produce=capacity ÷ SAM of the garment. Through the production accounting team IEs are collect the production data of each process that is collected hourly base. The team collects the operator loss time and hourly production by using GUM Sheet (shown at appendix 2). Using the data IEs are calculate operator performance, process efficiency, utilization, on standard time, loss time or off standard time etc. And that are compile in the operator performance evaluation sheet. ( oprator performance evaluation sheet is shown at appendix 3). So that operator performance is (336.40/570) * 100% = 59.02%. Cost per minutes = (Total cost / total produced minutes) within a specific period of time. Then calculate the total loss by multiplying loss time with cost per minutes. 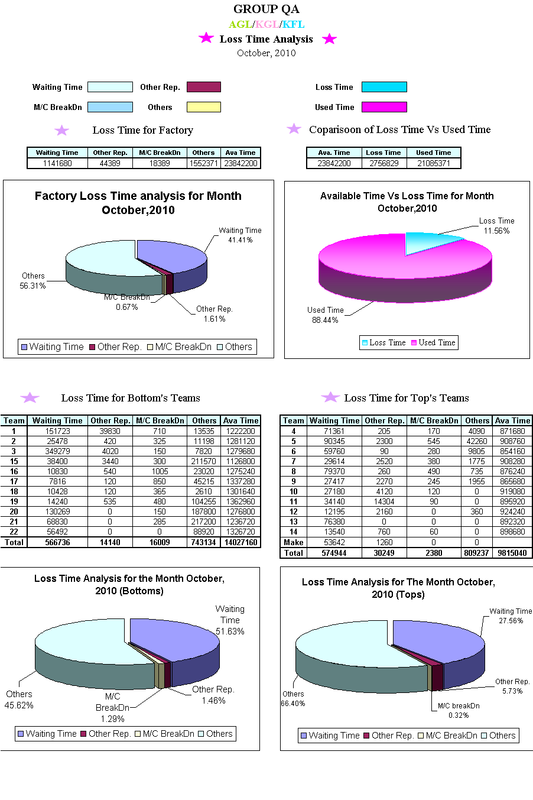 The report of cost and loss time analysis is shown in figure 5.3 and figure 5.4 respectively. 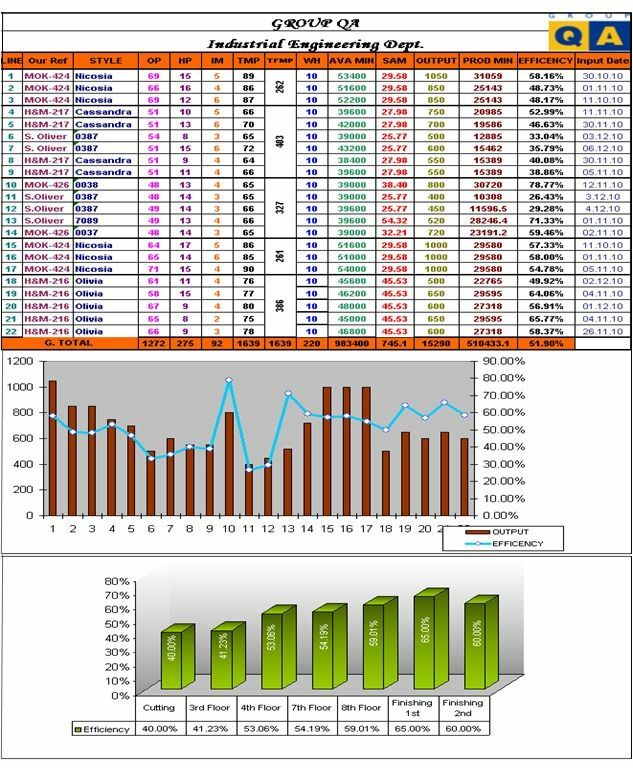 IE team monitor and report all information to higher authority through following one page MIS which represent daily factory efficiency, capacity utilization, DHU (defect per hundred unit), rejection percentage of several section, PCD (Planned cut date) conformance and absenteeism of worker. Line balancing is the process of proper workload distribution. In briefly, all processes don’t take same time to complete, so that target of each process is not same. Example: one operator of ‘sleeve joint’ can make 50 pcs per hour, but the operator of preceding process called ‘side seam joint’ can make only 25 pcs per hour. Then to ensure 50 pcs production we put two operators in first process. To balancing the line IEs are calculate target by using SAM. Here the formula of getting target is “Working hour/SAM”. To get the balancing target at first calculate the balancing target. Here ‘Pitch time is the main tools to get the balancing or optimum target. Example: one garment SAM is 35.5 minutes ant allocated machine for this garment is 70 then the pitch time will be 0.51 minutes. Now time to calculate the balancing target. Then IEs are working for getting 117 pcs per hour from each process and balancing the line as required. The floor peoples are not aware as need to reduce throughput time (different between the time of input and output). Line balancing method is not properly used in the production floor to ensure the optimum use of manpower. 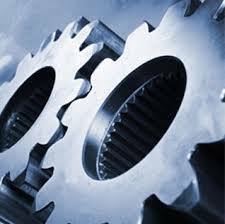 Machine mechanics react slowly while any machine breakdown as a result production is being reduced. Most of the time the raw materials are not in-house in time so that the production being hampered. Command and control over floor level does not exist. Almost senior operators never follow the supervisor. Almost the floor people do not aware about their performance as well as the team efficiency. Clumsiness of house keeping and working environment. The thread, fabric, cartoon etc are being scatter in the floor. Rarely use of ratio input to the sewing line from cutting. As a result the sequence of shipment sometimes skipped. Example: At first 34 size garment need to be shipped and then 42 size garment. But in sewing first they start 42 size garments to sew so that they failed to maintained shipment schedule. Huge scales of thread are wastage over floor by the operator. KFL has no personal wash plant so that it depends on other as a result the washing process delayed. The following analysis of strength, weakness, opportunities and threats (SWOT) concisely sum up the conclusion of the competitiveness of Kaniz Fashions Limited in firm level of Bangladesh Garment industry. It has self energy plant of 50 Mega watts that support for the entire factory energy. And as a result uninterrupted electricity can be maintained. The management of the organization always seeking for the new technology as well the IE team always tries to update with the latest technology to cope with the competitive global market. KFL always provides priority to experienced candidate and the employee turnover rate is also very low. For low turnover of the employees become experienced. For lack of proper communication and gaudiness the sample lead time, raw material leads time etc are very high in KFL. KFL has no research and development lab so that new product development is not possible there. It just works on buyer provided design. KFL infrequently arrange employee training but it’s very insufficient for the employee growth. Labor cost of Bangladesh is lower than other country. So it is grate opportunity to use these. Looking forward to Duty free Access to US, talks are on, and appear to be on hopeful track. In our country almost banks are provide loan at 7% interest for the export oriented organization. The competition of RMG sector is increasingly growing because of abolishing of quota system. The lead time of custom clearance is uncertain so that the it’s difficult to maintain the schedule of material in-house. Today strike is natural as our political environment so that it’s also difficult to maintain properly schedule of shipment. There is an international pressure group to compel the local producers and the government to implement social acquiescence. The US GSP may be cancelled and purchasing from US & EU may decrease significantly. The Bangladesh readymade Garment industry has achieved great success over a short time of period. The garments industry has become the main source of export and major driver of the GDP of Bangladesh. However the global market environment for textile and clothing industries is in transitional stage and will change at the end of the phasing out quota. The change in global trade will create new challenges for the Bangladesh RMG industry. The Quota free business environment will allow the competitors to take away the global market share from Bangladesh. Therefore high productivity, free access in backward supply line, shorter lead time will determine the industry competitiveness. To manage this aspect RMG sector updating and practicing new technique and technology. Industrial engineering practices are a new technique practicing in Bangladesh RMG. Kaniz Fashions Ltd. also aware of that context. On this objective it starts its Industrial Engineering Department for making all process of the organization efficient and reduces the cost. All IEs of KFL are very intelligent and technical and are working hard to achieve the organizational goal. At end of all, it’s say that establishing and continuing Industrial Engineering Department has a great prospect for the organization to compete with the modernize competitor as well as the fastest growing global market. KFL should organize training program for the floor people to increase their performance. The subject of training should be thread management, operator performances, line efficiency and balancing etc. It should assign a coordinator immediately to control supply chain properly for uninterrupted raw material supply. If coordinator assigned then he can control the delay of raw material in house and always communicate with all suppliers to get raw material in time. It should organize counseling program about importance of housekeeping; develop working environment, increase promptness of maintenance and how to increase floor efficiency. Establish incentive plan according to operator performance evaluation. That influences the operator to achieve their target. To increase awareness about thread wastage it should be arranged training program with production worker. Organize leadership training for increase the leading power of supervisor, line chip, and floor in charge. So that they can control their. It should developing manpower and machine sharing culture along several teams so that the use of optimum manpower can be done. Increase communication with washing agent to reduce the washing delay. Sewing input controlled as per ratio of shipment from cutting so that the shipment sequence can be maintained. Develop skill matrix for better balancing and reduce the effect of absenteeism.